But how did this specific type of situation come to be a crucial motivator for so many people to lose weight? The answer has to be partly to do with how a day out at a theme park is supposed to be about escapism from the realities of life. Being told that you cannot ride a rollercoaster or other attraction because of your size would be an extremely traumatic and embarrassing event for many people. The situation is exacerbated because it has taken place in an environment of escapism and fun. An issue that is frequently a source of unhappiness in daily life coming up on a day out to a theme park has been the inspiration numerous people have needed to finally take losing weight seriously. “All I could feel was the sniggers. I tried to laugh it off but inside I was crying with shame,” Donna McCann said after being rejected from an M&Ds rollercoaster in Scotland. She weighed around 18 stone at that point. “I was embarrassed to the core. I cringed at the thought of being humiliated in front of a crowd of people again,” Donna, now 10 stone added. Another reason that has been cited for people losing weight as a result of ride rejection is seeing their young children miss out on fun experiences. Hayley Donaldson was approaching 20 stone when she was told that she was too big to ride the drop tower while accompanying her daughter at Gullivers Kingdom. “I was too big for the safety bar to come down and so had to do the walk of shame off the ride,” she said. In the United States, rides are increasingly being fitted with seats capable of accommodating those with larger girths, but these customisations have only been seen on a limited scale in the UK so far. 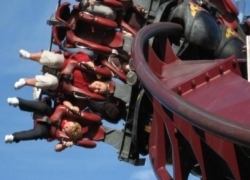 4 Comments on "How rollercoaster rejection inspires weight loss"
This article is slightly unfair to suggest that only weight is the reason for a walk of shame; which is not true. At Light water Valley on Eagles Claw, I had to make this walk along with another 2 for reasons aside from weight. I was too broad for the restraint – no amount of weight loss will get me on that ride. Another man for being a body builder – not overweight but muscular. A lady for having larger than average breasts. This is believe is a problem with the ride, park and manufacturer not people’s weight. I do not feel that the article suggests it’s the only reason people are rejected from rides, but that it has served as motivation for people to lose weight on a number of occasions. Count me as another example. In 2003, I weighed 16.5 stones when I went to a fair specifically to ride the then-new KMG Move It 32. I wasn’t turned away, but it took a lot of effort to fit into the restraint, and ended up hating the ride, as I was squashed very uncomfortably into the seat. The incident gave me the motivation to become serious about losing weight, and later discovered that Move It 32 is much more fun when you’re 11 stones! Great story and well done John!